Course Announcements Announcements about the course will be posted here. Please check the site regularly for announcements (which will also be given in lecture and/or in recitation). There are currently no announcements. There will be a review session for the Final Exam on Thursday, May 5th, 7 pm 8:30 pm, Physics P122. There will be a review session for Exam 2 on Tuesday, April 19th, 7 pm 8:30 pm, Physics P123. There will be a review session for Exam 1 on Wednesday, March 9th, 6 pm  7 pm, Physics P  127. There are solutions to Problem Set 1 posted on the Blackboard page. Because of issues related to access, solutions will only be posted on Blackboard. There are supplementary notes for Chapter 1. E-mail announcements for this course will be sent through Blackboard. If you are new to Blackboard, or if you have not used Blackboard in some time, please log on to Blackboard and review the e-mail information. Please follow the instructions for e-mail forwarding if you prefer an e-mail address different from your official Stony Brook University e-mail address. Course Description The description in the undergraduate bulletin: Continuity, differentiation, and integration in Euclidean n-space. Differentiable maps. Implicit and inverse function theorems. Differential forms and the general Stokes's theorem. Prerequisites C or higher in MAT 203, 205, or AMS 261; C or higher in MAT 211 or AMS 210; B or higher in MAT 320 Advisory Pre- or Corequisite: MAT 310. 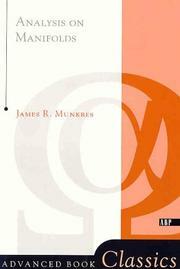 James R. Munkres, Analysis on Manifolds. available at the University Bookstore @ Stony Brook. In addition to the required textbook above, for part of the course there may be additional course notes which will be made available through the Blackboard page. Lectures The instructor for this course is Jason Starr. There are assigned readings in the syllabus which are to be completed before lecture. During lecture the instructor and the students will discuss the material in those readings, there will be exercises to practice the material, etc. For the lectures to be effective, you must complete the assigned reading from the syllabus before lecture. Lecture is held Tuesdays and Thursdays, 11:30AM  12:50PM in Earth and Space Sciences 181. Office Hours Office hours are tentatively scheduled for Tuesdays 4  5PM, Math Tower 4108 and Thursdays 2:30  3:30PM, Math Tower 4108. Additionally, I am advising in Math Tower P143 on Tuesdays, 2:303:30PM. You may also contact me to schedule an appointment. The grader is Dingxin Zhang. Dingxin has office hours in Math Tower 2114 on Wednesdays, 9  10AM, and in the Math Learning Center on Tuesdays, 4  6 PM. Grading System The relative significance of exams and problem sets in determining final grades is as follows. Graded problem sets and exams will be handed back in lecture. If you cannot attend the lecture in which a problem set or exam is handed back, it is your responsibility to contact the instructor and arrange a time to pick up the work (typically in office hours). Students are responsible for collecting any graded work by the end of the semester. Academic Resources There are a number of organizations on campus offering tutoring and other academic resources in various locations. The mathematics department offers drop-in tutoring in the Math Learning Center. You are strongly encouraged to talk to a tutor in the MLC if you have an issue and are unable to attend your lecturer's office hours. The University Senate has authorized that the following required statements appear in all teaching syllabi on the Stony Brook Campus. If you have a physical, psychological, medical or learning disability that may impact your course work, please contact Disability Support Services, ECC(Educational Communications Center) Building, Room 128, (631)632-6748. They will determine with you what accommodations, if any, are necessary and appropriate. All information and documentation is confidential. Students who require assistance during emergency evacuation are encouraged to discuss their needs with their professors and Disability Support Services. For procedures and information go to the following web site: http://www.ehs.sunysb.edu and search Fire Safety and Evacuation and Disabilities. Academic Integrity Each student must pursue his or her academic goals honestly and be personally accountable for all submitted work. Representing another person's work as your own is always wrong. Faculty are required to report any suspected instances of academic dishonesty to the Academic Judiciary. Faculty in the Health Sciences Center (School of Health Technology & Management, Nursing, Social Welfare, Dental Medicine) and School of Medicine are required to follow their school-specific procedures. For more comprehensive information on academic integrity, including categories of academic dishonesty, please refer to the academic judiciary website at http://www.stonybrook.edu/uaa/academicjudiciary/. Critical Incident Management Stony Brook University expects students to respect the rights, privileges, and property of other people. Faculty are required to report to the Office of University Community Standards any disruptive behavior that interrupts their ability to teach, compromises the safety of the learning environment, or inhibits students' ability to learn. Faculty in the HSC Schools and the School of Medicine are required to follow their school-specific procedures.